Let me get one thing clear straight up: I am a lazy runner. I began running again about 25 kg more than my weight when I last ran as a teenager. Minimising the effort required to lug around the extra flab was essential to get me running. This is my experience. I began my journey by trying to find hints that would minimise the effort required to run. In the process, I discovered that improving my form could also help eliminate my shin splints. I started by attempting a running form which I later discovered was very similar to the Chi Running and Pose Running techniques. My breakthrough really came when I started running with a metronome clipped to my shorts. Many running books and online forums advocate a running cadence (number of times one leg strikes the ground each minute) of 90. But how to achieve that magic number? Too many, myself included, plod along at a less than optimal running cadence. Apparently 90 steps per minute gives the optimum air time versus foot in contact with the ground time. The first thing that I did was bought a $10 clip-on metronome off eBay. These things are not water proof so do not try running in the rain or dumping a cup of cold water over your head to cool down. And if you are feeling self-conscious about running along beeping, either get yourself earphones or just pretend it is your heart rate monitor beeping away like you see on hospital TV shows. Next I needed to work out my current cadence. I simply looked on my Garmin FR60 watch with heart rate monitor and foot pod. If you do not have a watch that also gives you cadence, run for a minute counting the steps for one leg. I started out running with a natural cadence at around 80. I call this a double step cadence because each cadence is a one step on both the left and right legs, which is actually two steps one on each leg. I set the metronome to my natural cadence of 80 and ran in time with my right leg. Having the focus all on one leg all the time led me to feel unbalanced after a while. I liked to alternate between counting with my left leg, and later counting with my right leg to keep some sort of balance to my running – I found it hard to alternate because I would prefer counting using my right leg and could not easily swap over to my left. I found that the natural tendency was to run in time with every time I slammed my foot down onto the pavement, but this could lead to a very heavy running style. Instead, I ran in time with my foot lifts — and I do mean foot lift rather than foot push off. I aimed to lift my foot into the air allowing my body to glide along level; rather than pushing off strongly and bouncing into the air. Pushing off, I was consuming extra energy to lift my overweight body into the air every time I took a step! Why bother when I didn’t have to? What worked best for me though, was what I call a triple step cadence. Once I had done a few runs and got comfortable running with one leg (a left and right leg double step) in time with the metronome, I tried setting the metronome to two thirds my natural cadence. In my case, this was 53.3 (80*2/3), which I found comfortable to round up to 54. Now I tried running with three foot lifts (both legs) per beep – the foot lifts naturally fell on an alternate foot every time. I practiced this while walking or moving my hands in time to counting 1, 2, 3, 1, 2, 3 – a bit like a waltz really. Using a triple step to every beat gave me a nice, balanced rhythm to my run. After several runs, I was able to let my mind drift off onto other topics and naturally kept in time with the metronome beat. Finally, it was time to lift my cadence. What I did was to run the first half (after warming up of course) of my 10 km run comfortably at my natural triple step cadence of 54 (= 81 double steps per minute). On the second half of my run, I would lift my cadence by one beat per minute to 55 (= 82.5). This is not so great a leap that I could not run in time with it. Once, 55 became comfortable, I would then start my run at 55, and run the second half at 56. This is slowly lifting my cadence to the optimal 90 steps per minute (or 60 beats using a triple step). As I ran with a faster cadence, I naturally needed to modify my gait to work at the faster rate. I also ran with the same cadence up hill and down – if I needed to speed up or slow down, I changed my stride length instead. As I lifted my cadence I let the natural laws of physics do the work for me – I simply lifted my foot higher as I picked it up, but not changing the motion of my knee. The natural pendulum effect of shortening the distance between my hip and foot allowed my cadence to lift with minimal extra effort. When my foot landed, I would allow it to fall naturally under my body (not striding out the front) without worrying about whether I was landing on my heel, mid-foot or forefoot. Finally, standing tall with a gentle lean from my ankles I let gravity pull me along, making all the above seem easy. 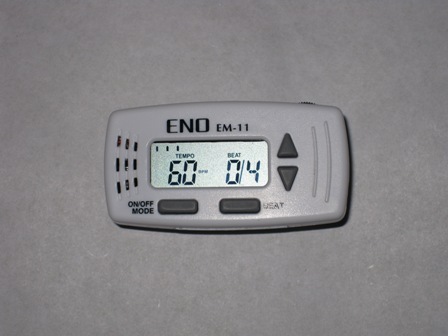 Buy a $10 clip on metronome off eBay. Work out your current natural cadence towards the end of your regular run either from a watch with a foot pod or simply count the number of strides you take in a minute with one leg. Practice a double step cadence — set your metronome to your natural cadence and then run with the lift of one foot in time with the beep (that is two steps counting both feet). Run for a while with one foot in time, then swap feet. Keep the same cadence whether running up hill or down, just change your stride length to speed up or slow down. When you have mastered the double step cadence, change to a triple step cadence – one beep equals three steps with both legs; this will alternate the leg that the beep falls on to give a nice, balanced run. After warming up, run the first part of your run at your natural cadence; run the second part of your run at one beat per minute faster (that is three steps if using triple step cadence). When the second, faster part of your run feels comfortable, run at that cadence for the first part of your run, and again lift the second part of your run by one beat per minute. Repeat until your natural cadence has reached around 90 steps per minute. Lift your foot higher while keeping the arc of your knee the same (the reduced length of the pendulum swinging from your hip will increase your cadence with minimal extra effort. Let your foot land naturally under your body. 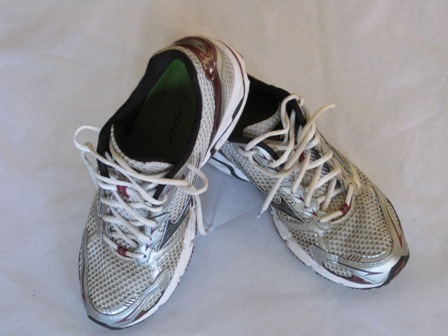 Do not over stride out in front, and do not worry about whether you have a heel, mid-foot or forefoot landing. Hold your body upright, and then lean gently from your ankles, letting gravity drag you along. I have been struggling with injuries for a while. I think that these ideas will help me.